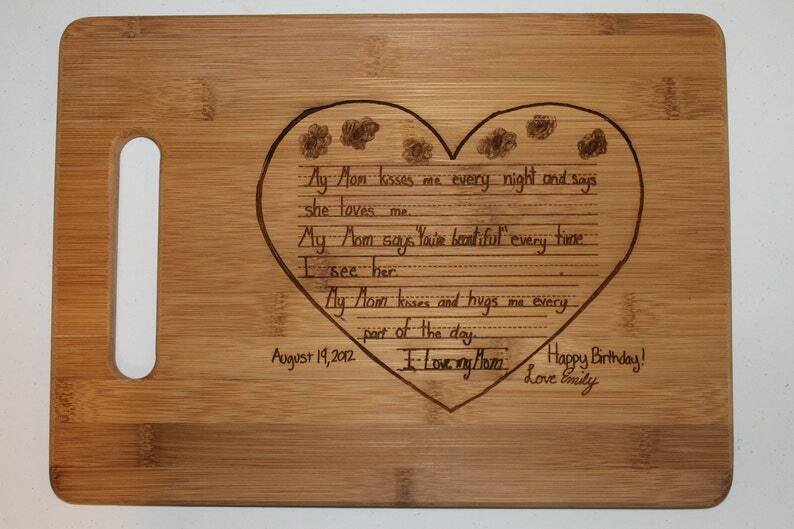 3dcarving is the home of the hand written recipe scanned then engraved on a Bamboo cutting board. As seen on the Today show for Mother's Day 2012, Real Simple magazine and their Mothers Day Phone App, Country Living Magazine, US Magazine, The Week Magazine and People.com. Create a treasured love note or poem for Valentine's Day or Mother's Day. Have your favorite hand written love note laser engraved on a Bamboo Cutting Board. Custom laser engraved bamboo cutting board with a hand written love note or poem. One side engraved with your scanned note. A touching way to show your love, respect and appreciation to a loved one. A great gift for Valentine's Day, Mothers Day, bridal showers, or wedding gifts. Your scan should be exactly what you want engraved, we do not edit or add to your scan. 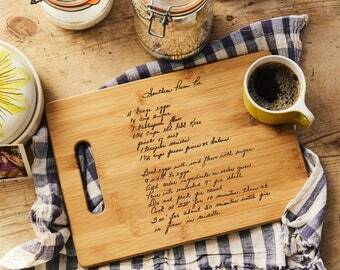 If you are creating a new Recipe please use white paper and a thick black sharpie for best results. 1) Instead of snapping a photo with your cell phone, please download the app I have listed, then take a photo within the app. 2) If your recipe is on two cards, you can take the photo separately and send two files. 3) Another tip is taping it to the wall where you have good lighting. 4) Aim straight on to avoid shadows and distortion. Then attach the JPG file in an Etsy conversation with your order number listed. Please use your order number for all conversations. Please drop me a note if you have any other questions, your efforts will be worth it! All proofs are created in the order received and are sent in the evenings and on weekends. Items are shipped via US Postal service Priority Mail 2- 3 days. You will receive a tracking number via Etsy. PLEASE, PLEASE, PLEASE log into your Etsy account to check for your proof and to approve your proof. No items will be made and shipped without your approval. Please look for your proof evenings and weekends. Thank you for looking and feel free to ask any questions. Just ordered these for gifts for my kids. Pam and Wayne were incredible - we worked together to get the design the way I wanted it. Got delivered 4days later - incredible!!! Fantastic quality, great customer service - these are gifts for all my kids next year (getting a head start😊). They will LOVE them! So excited to give these as gifts this Christmas! They turned out better than expected! Absolutely perfect! Easy to work with the shop and quick response as well! This will be the best Mother’s Day gift!